Our supervisor Prof. R. Sowdhamini (centre) with CAPS lab members, December, 2018! Our newly minted Dr. Snehal Dilip Karpe has joined Dr. Anne Van den Broeke's group working at Institute Jules Bordet in Brussels, Belgium as a Post-doctoral Fellow- Bioinformatician on April 1st, 2019. Their work, funded by FNRS, Belgium will be in collaboration with Prof. Michel Georges from GIGA , University of Liège and involves genomics analysis of tumour evolution in HTLV-1/BLV induced leukemia progression. Congratulations and wishing you the best ahead! The Biomolecular Interactions Symposium (BIS) in the honor of Prof. P. Balaram was co-organized by Prof. Sowdhamini R, Dr. Radhika Venkatesan, Prof. Mathew M K and Dr. Gurunath (IITK) at NCBS, Bangalore between 18th and 19th of February, 2019. CAPS group members also helped out with the exciting event, details of which can be found here. Shailya Verma from the GS-2018 batch has joined our lab as an Integrated PhD candidate on the 11th of Feb, 2019. Welcome to CAPS group, Shailya! Dr. Sheetal Ambardar has joined our lab as a Postdoctoral Fellow on the 1st of February, 2019. 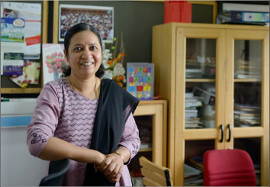 Her fellowship is funded by the DST Women Scientist A (Government of India) scheme. Welcome to CAPS group, Sheetal! Dr. Adwait Joshi was selected to present a talk at the conference The Language of Biology as part of the NCBS annual talks 2019. This talk was titled Protein domain architecture comparison for inferring homology between multi-domain proteins using alignment-free method and was presented on January 23rd, 2019. Bhavika Mam, Neha V. Kalmankar, Soumya Rath, Teerna Bhattacharyya and Vikas Tiwari particpated in presenting posters at the NCBS Annual Talks 2019: The Language of Biology held between January 20th and 23rd, 2019. Prof. R. Sowdhamini presented a delightful science talk in Tamil, one of the oldest and major Dravidian classical languages known in history! This talk, as part of the Jigyasa Project, was titled "Revealing the science behind traditional practices through plant genome sequencing". The Jigyasa Project is a collaboration between Mandram and the Bangalore Life Sciences Cluster (BLISc) and its talks aimed to offer insights into the topic: Traditional Knowledge meets Modern Science. It was held at NCBS on the 15th of December, 2018. Bhavika Mam was selected to participate in the Indo-US conference: Sculpting the Future of Medicine- Gateway to the post-proteogenome era (symposium and workshop) held at ACTREC, Navi Mumbai, India between 7th and 11th December, 2018. Bhavika was awarded second prize in the Best Flash talk series in the symposium. Neha V. Kalmankar attended the 4th International Conference on Circular Proteins and Peptides at Kawasaki, Japan between 28th to 30th November, 2018 & the 10th International Peptide Symposium (10th IPS) at Kyoto, Japan between 3rd and 7th December, 2018. She was selected to participate and present a poster in both the conferences for which she was awarded a Travel Award each. Neha was also selected to give a Hot-spot Talk at the 4th International Conference on Circular Proteins and Peptides conference. Snehal Dilip Karpe successfully defended her thesis towards Ph.D., submitted to the Tata Institute of Fundamental Research, on the 2nd of November, 2018. Snehal's thesis seminar was on "Deciphering odor affinities of olfactory receptors through genome-wide survey, molecular modeling and docking studies". Congratulations, Dr. Snehal Dilip Karpe! All the best ahead. Dr. Mahita Jarjapu has joined as a post-doctoral fellow in Dartmouth College, Hanover, New Hampshire, USA in the lab of Prof. Chris Bailey-Kellogg at the Department of Computer Science. Congratulations and wish you success in your future endeavours! Teerna Bhattacharyya attended the 17th European Conference on Computational Biology (and its pre-meetings) in Athens, Greece, 8/9-12th September. Along with volunteering for the event, Teerna also presented a poster titled "PASS2 version 6: a database of structure-based sequence alignments of protein domain superfamilies in accordance with SCOPe". In addition to a conference-sponsored registration-fee waiver, travel was funded by the Infosys foundation through an intramural grant. Nithish Sathyanarayanan received Best speaker award at the 46th National Seminar on Crystallography (NSC46) organized by the Indian Crystallography Association at NIMHANS, Bangalore between June 27th and 29th, 2018. Congratulations, Nithish! Adwait Joshi submitted his thesis towards Ph.D. to Manipal University on the 27th of June 2018! Snehal Karpe presented her work at Cold Spring Harbor Laboratory (CSHL), New York, USA in two conferences. Her poster titled "Candidate olfactory receptor protein subfamilies involved in the shift to eusociality: computational survey of ORs from two solitary bees" was presented at the Biology and Genomics of Social Insects, 5th to 8th May 2018. Another poster titled "InsectOR : A web-server to identify olfactory receptor genes from insect genomes" was presented at the Biology of Genomes, 8th to 12th May 2018. Snehal also presented work at Prof. Gene Robinson's Lab at UIUC, Illinois and at Dr. Lucy Forrest's Lab at NINDS, NIH, Washington DC. Funding for the same was provided by DST-SERB International Travel Scheme and Infosys Travel Grant. Harini K, Meenakshi Iyer, Pankaj Chauhan and Shafi Kallayi presented posters at the Annual Talks at NCBS from January 3rd to 5th, 2018. Pankaj Chauhan participated in the Indian Conference on Bioinformatics (InBIX'17 conference) organized by the Birla Institute of Scientific research and Bioclues.org at Jaipur between November 7-9, 2017. His work was also selected to be presented in the form of a short video abstract. Shaik Naseer Pasha has secured the DBT-MRC joint postdoctoral fellowship with Prof. R. Sowdhamini at NCBS and Dr. Carla Martins at the MRC Cancer unit at Cambridge. October 1st, 2017. Congratulations and we hope to see more amazing work in the future as well! Bhavika Mam participated and volunteered in the BC2 conference hosted by the Swiss Institute of Bioinformatics at Basel, Switzerland. Sepember 12-15, 2017. She was also a visiting student at the University of Nantes, France. Pritha Ghosh secured a post-doctoral fellowship in the lab of Prof. Janusz Bujnicki at the International Institute of Molecular and Cell Biology, Warsaw, Poland. October, 2017. Congratulations and wish you success in future endeavours! A study on RNA-binding proteins titled Bioinformatics comparisons of RNA-binding proteins of pathogenic and non-pathogenic Escherichia coli strains reveal novel virulence factors by Pritha Ghosh and R. Sowdhamini is now out: BMC Genomics 18:658 (2017). Mahita Jarjapu successfully defended her Ph.D. thesis, submitted to the Tata Institute of Fundamental Research, on 18th of August, 2017. Congratulations, Dr. Mahita Jarjapu! Her thesis seminar was on "Insights into Toll/interleukin-1 receptor (TIR) domain-mediated protein-protein interactions within the Toll-like receptor signalling pathway through computational approaches". Mahita's courage, hard-work, talent and persistence have been most inspiring to us all. Mahita has received bridging Postdoctoral Fellowship from NCBS and continues to work on some exciting projects in our lab! Dr. R.S. Sajeevan has joined our lab as a National Postdoctoral Fellow on the 22nd of May, 2017. His project is sponsored by SERB (Government of India) and is titled: Engineering stress inducible super promoters for multiple abiotic stress tolerance in plants. Welcome to CAPS group, Sajeevan! Dr. Pritha Ghosh and Teerna Bhattacharyya were selected to participate in the Annual Symposium of the Indian Biophysical Society hosted at IISER Mohali from the 23rd to the 25th March, 2017. Pritha was invited to give a short twelve-minute talk as part of the Young Researchers Talk segment where she presented on A tale of two paralogs: Human Transformer2 proteins with differential RNA-binding affinities. Meanwhile, Teerna had been selected to present some of her thesis work as part of a poster titled Sequence and Structural Analysis of Gene Products containing Tyrosine Phosphatase Domain. It was an interesting experience for them both! Mahita Jarjapu was among the five awardees of the Keystone Symposium Future of Science Scholarship to attend the Keystone Symposium Conference on Pattern Recognition Signalling:From Innate Immunity to Inflammatory Diseases at Banff, Canada from 19th to 23rd March, 2017. Prof. Sowdhamini and Prof. Srinivasan gave talks in SBCADD '17 held in Alagappa University, Karaikudi between 14th and 17th February 2017. Shaik Naseer Pasha successfully defended his Ph.D. thesis, submitted to Manipal University, on 9th February, 2017. Congratulations, Dr. Shaik Naseer Pasha! You too have made us very proud! Naseer joins as a postdoctoral fellow in Dr. Dhandapany Perundurai's lab at InStem. Prof. Sowdhamini and Prof. Srinivasan gave talks in the National Conference on Computational Analysis of Molecular Data in Synergy with Biological Applications (CAMB-2017) held at Bishop Heber College, Trichy on 3rd February 2017. Pritha Ghosh successfully defended her Ph.D. thesis, submitted to the Tata Institute of Fundamental Research, on 25th January, 2017. Congratulations, Dr. Pritha Ghosh! You have made us very proud! Pritha has received bridging Postdoctoral Fellowship from NCBS and will continue to work on some more exciting work in our lab! Dr. Kaushik Hatti, who submitted his Ph.D. thesis to the Molecular Biophysics Unit (MBU), IISc has joined our lab starting 2nd of January, 2016! Welcome Kaushik!! Prof. Sowdhamini delivered a highly lauded talk to the student crowd on the 3rd of December at the DHR-sponsored Training Program on Drug Chemistry held between November 15th to December 14th, 2016 at the JSS College of Pharmacy, Mysore. It was very well-received and extremely appreciated! Meenakshi Iyer attended the "National Symposium on Bioinformatics and Computational Systems Biology" held at Central University of Himachal Pradesh, Shahpur from November 12-14, 2016. She also gave a flash talk and presented a poster on "Search of sequence homologues and update of the GenDiS database". Pritha Ghosh submitted her thesis towards Ph.D. to the Tata Institute of Fundamental Research on the 21st of October 2016! Oommen Kaleeckal Mathew submitted his thesis towards Ph.D. to SASTRA University on the 8th of November, 2016! Anshul Sukhwal submitted his thesis towards Ph.D. to SASTRA University on 4th October 2016! Naseer Pasha submitted his thesis towards Ph.D. to Manipal University on 27th September 2016! Snehal Karpe presented a short talk as well as a poster titled "Identifying odorant receptor multi-protein superfamily from Apis florea genome" at the prestigious International Conference on Bioinformatics (InCoB2016) in Singapore held between the 21st to the 23rd of September 2016. Snehal won the Bronze award for the poster! She was funded by Prof. Sowdhamini and also won a partial travel grant from many sources including the organizers of the conference APBionet (Asia-Pacific Bioinformatics Network) and CICS (The Centre for International Co-operation in Science). Congratulations, Snehal! Atul Upadhyay successfully defended his Ph.D thesis, submitted to the Tata Institute of Fundamental Research, on 23rd December, 2015. Congratulations, Dr. Atul Upadhayay! Khader Shameer, an alumnus of the lab, was awarded the Bioclues Innovation, Research and Development (BIRD) Award for the yer 2015 for his outstanding contribution to the area of Functional Genomics and Bioinformatics. The research conducted in a joint project involving researchers from the lab as well as certain researchers of the Bangalore BioCluster leading towards the sequencing of the Tulsi genome and unraveling its medicinal properties was covered by The Hindu newspaper. The link to the news article can be found here. K.Harini was successful in defending her Ph.D thesis held on the 3rd June, 2015 in the NCBS campus. Margaret Sunitha, fondly known as Maggie, successfully defended her Ph.D thesis on 17th March, 2015. Prashant Shingate successfully defended his Ph.D thesis, submitted to Manipal University, on 30th January,2015. Mahita was awarded with one of the NCBS Best Poster Prizes during the NCBS Annual Talks, the theme of the talks being "Biology Across Scales", held from 5th to 8th January,2015. Sony Malhotra successfully defended her Ph.D thesis, submitted to the Tata Institute of Fundamental Research, Mumbai, on 9th December, 2014. Eshita successfully defended her Ph.D thesis, submitted to the International Institute of Information Technology (IIIT),Hyderabad on 6th November, 2014. Harini Krishnan and Margaret Sunita have submitted their Ph.D thesis to Bharathidasan University,Trichy, Tamil Nadu on June 27th, 2014. Gandhimathi successfully defended her Ph.D Thesis, submitted to Bharathidasan University, Trichy, Tamil Nadu, in March 2014. Swati Kaushik successfully defended her Ph.D thesis,submitted to the Tata Institute of Fundamental Research (TIFR Deemed University), Mumbai on 30th January, 2014. Gandhimathi won the second place in Best Poster Award for a poster entitled "structure-based virtual screening and evolutionary analysis for the identification of small molecule inhibitors to abrogate protein-protein interactions and paracrine Hedgehog signalling" during the International Conference on Recent Advances in Computational Drug Design organized by Schrodinger held on 16-17th Sep 2013. Mahantesha successfully submitted his Ph.D thesis to the University of Agricultural Sciences,Bangalore on 16th September, 2013. Nagarathnam submitted her Ph.D thesis to Anna University, Chennai on 21st June, 2012. Ganesh Pugalenthi won the Bioclues Innovation, Research and Development (BIRD) Award for the year 2011, awarded by Bioclues, a non-profit virtual organisation, for his work on the development of bioinformatic tools such as DIAL, SMotif,SPRED and ScanMot to anlayze protein sequences, structures and next-generation sequencing data, in the light of more and more databases being developed accompanied by an ever-increasing amount of data. Gold Medal from the Institute of Success Awareness for the year 2011. 2010.Subsequently she was elected as a fellow to the Indian National Science Academy (INSA), in December 2010. Prof.R. Sowdhamini was appointed as the Principal Investigator for a project involving an interdisciplinary approach, employing bioinformatics, experimental biochemistry-biophysics and mathematical modelling. This award is special as it is the first HFSP programme grant where an Indian researcher is a Principal Investigator. This grant will be used to fund a research work on a group of mechanosensory proteins called myosins carried out between the labs of Prof R. Sowdhamini, Prof. James Spudich (Stanford University, USA) and Prof.Henrik Flyvbjerg (Technical University of Denmark). (DBT), Govt. Of India on 12th April, 2007.